"If we don't use words rightly, we shall not think rightly"
"If we do not think rightly, we cannot reliably decide rightly, because good decisions depend on accurate thinking"
"If we do not decide rightly, we shall make a mess of our lives and also of other people's lives to the extent that we have an influence on other people"
"If we make a mess of our lives, we shall make ourselves and other people unhappy"
Therefore, "Happiness depends at least partly on good grammar"
Premise (1) suggests that good grammar is the necessary condition for right thinking. On Gwynne's view, thought and language have a necessary connection. He writes, "Without words...we cannot think. We cannot reason things out, not even the simplest things." In turn, Gwynne suggests that an understanding of vocabulary necessitates grammar. The upshot of the argument is that the good life depends on grammar. What is interesting about this argument is that it depends on an assumption about the nature of reality. Grammar is simply the set of rules governing the use of a given language. Gwynne's argument assumes that those rules are objective features of reality, features discovered and not created by human beings. This line of argument appeals to those who are committed to the assumption that the world is rule-governed. To those who think like this, it comes as no surprise that underlying language and thought is some set of universally binding norms. Normativists think the same about ethics, laws of nature, logic, and politics. As Gwynne points out, what counts as a good life is one lived more or less in accord with those objective norms. Deviation from normativity is what leads to a bad life. A normativist about grammar is generally called a prescriptivist. Gwynne claims that he knows the right way to write in English and instructs his reader to act accordingly. However, there are those who oppose the idea that underlying any part of reality is some governing norm. Indeed, even if there were such things, they would be unknown to us. Norms are either an archaic idea to be disposed of or they are hidden realities with no intention of disclosing themselves with sufficient force to produce universal agreement. Non-normativists are generally committed to the idea that norms are reducible to expressions of preference. A common objection to prescriptivism is that it stratifies society, building an upper class based on their command of the right kind of writing and speech. In our present political climate, the non-normativist will accuse the normativist of some racial or gender predjudice. In a recent statement from at the University of Washington, Tacoma, the Writing Center made a set of promises. "We promise to... emphasize the importance of rhetorical situations over grammatical “correctness” in the production of texts... [and to] challenge conventional word choices and writing explanations." On the face of it, the center appears to suggest that norms should be broken in cases in which the situation demands it. We do this. All. The. Time. There is give and take on the matter in ordinary speech, tweeting, and advertising. But if this is what is being said, it is trivial at best. Given the aims of the statement--"to help students become more critical of these unjust language structures as they affect students’ writing and the judgment of that writing"--the center appears to be claiming that our general social situation is what is in view. In other words, given the situation we find ourselves in at the moment, a situation rife with systemic racism, we should override the norms of grammar in order to quash racism. In other words, according to the statement, a happier people are people who are prepared to break the norms of grammar if doing so prevents racism. However, having read Gwynne's Grammar, I cannot see how any of the rules of grammar perpetuate racism. Perhaps I am missing something! So the statement cannot be saying that the rules themselves perpetuate racism. What is more likely is that the statement is saying that people of different races use language differently and that we shouldn't force people to conform to the grammar of one race. Of course, this assumes that the rules of grammar are race-relative in which case they are not rules at all; they are preferences. And I think this is the problem - the writing center assumes that the rules of grammar are relative to cultures/races/genders. They are not universally binding norms to be discovered but rules chosen by those in power and imposed on the weaker. The prescriptivist generally replies that he does nothing more than discover and advocate for norms that are objective. 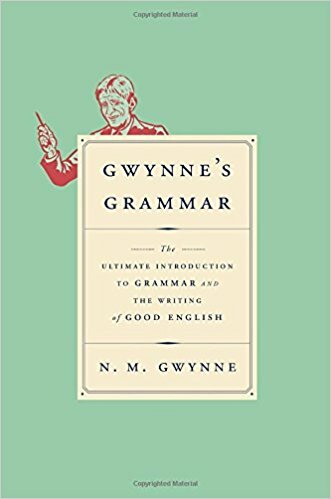 Anyone--not merely an elite--can learn the rules of grammar and, according to Gwynne, obtain greater happiness. To hold that there are objective norms according to which we should conduct our lives and by doing so will achieve greater happiness is not racist or bigoted. Of course, the response of the non-prescriptivist is that what the prescriptivist takes to be norms he discovers are really preferences he expresses. In other words, he merely wants to remake the world in his own image. The view that there are no objective norms in reality such as rules of grammar is a self-refuting assertion. Consider the statement, "We promise to... emphasize the importance of rhetorical situations over grammatical “correctness” in the production of texts." Presumably, the writer intends that the statement be taken seriously. The writer promises to perform some action and promises are binding according to an obligation that the writer takes to be normative. Furthermore, the statement assumes normatively by suggesting that we ought to emphasize situation over the rules of grammar. The trouble with thinking that there are no norms is that they appear to rear their head at every turn. This is especially true when we try to write or say anything. If I have made any grammatical errors on this page, feel free to point them out to me. In doing so, I hope you feel the weight of responsibility that normativity carries with it. You will not be telling me that you would prefer me to write differently, but that I ought to write differently.